Since we started planning for Indonesia vacation, we always wanted to move beyond Bali. 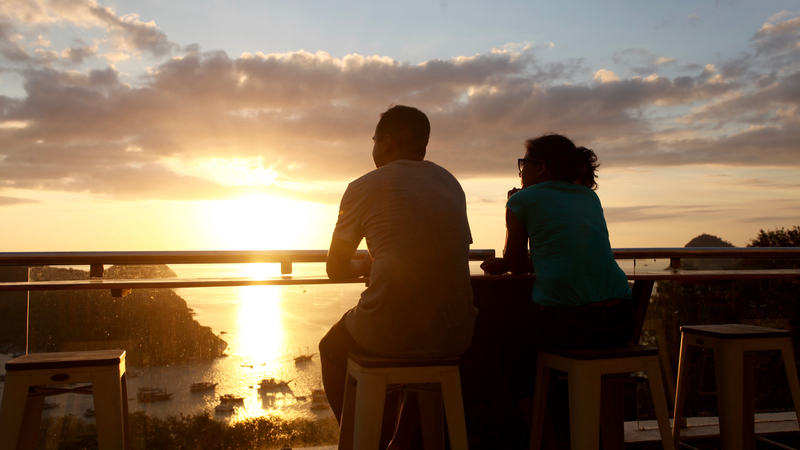 We were contemplating between Gili islands and Nusa Penida. 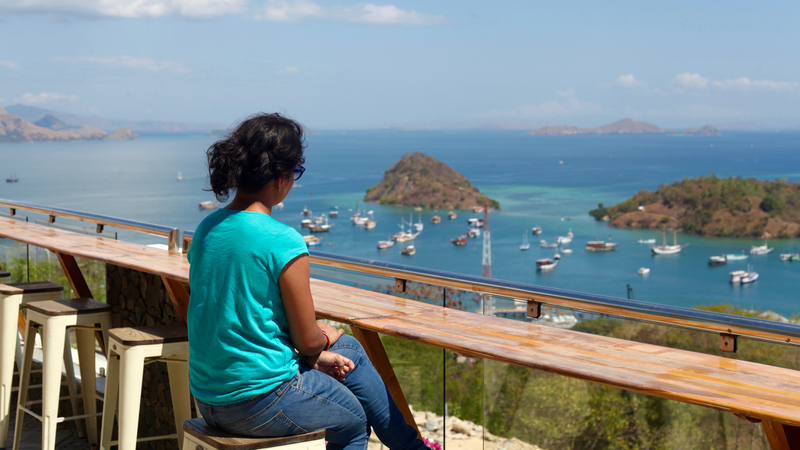 Somehow we found the mention of Komodo National Park as the topmost destination of Indonesia.Diving deeper we found that this is a gem and we must visit this place. The mascots of Komodo are the komodo lizards, the giant manta rays, the numerous green turtles, the sharks and the amazing corals of the national park. The area was designated at national park in 1980. 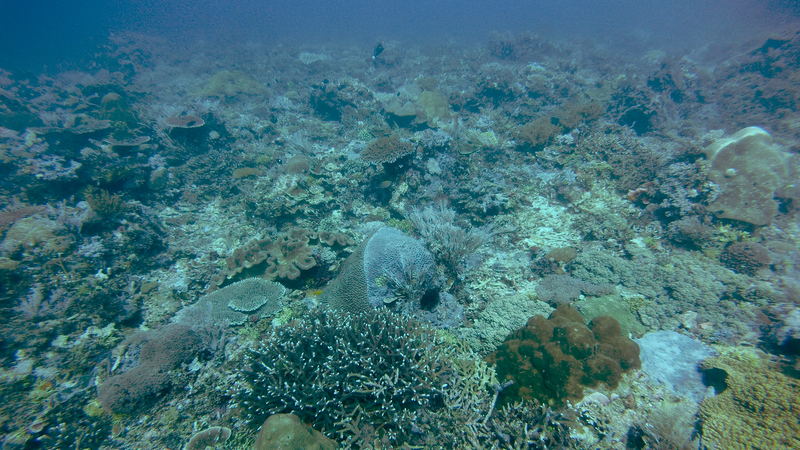 Since then the whole area is protected leading to amazing diversity particularly under water. We had 5 days to ourselves to explore the region. If you want to make most out of the park, make sure you spend atleast 3 days here. Day 1 (June 3 2018): We took a flight from Bali to Labuan Bajo on NAM Air. This is a partner of Sriwijaya Airlines of Indonesia. 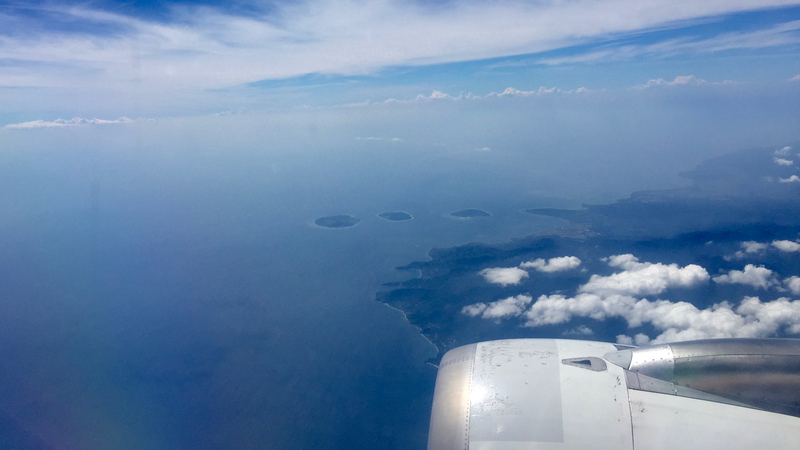 The flight from Bali to Bajo is quite scenic and you can see the islands, the huge volcanoes and the numerous reefs from the top. 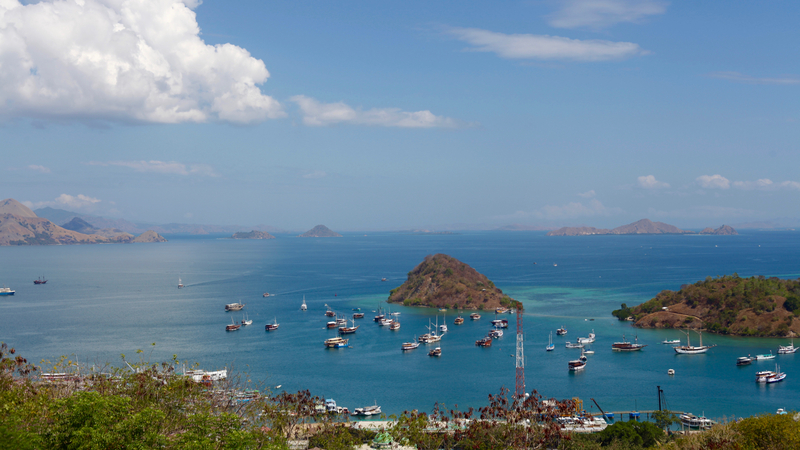 Labuan Bajo is the gateway to the last jurassic park of the world, The Komodo National Park. The small fishing town is slowly rising up and soon will be a hotspot with many more hotels and millions of tourists. We were booked in the beautiful Le Cecile Hotel and Cafe on top of a hill above the port. The view from the top is simply beautiful. The day was spent mostly in the pool and little exploration of the dive shops around the town. After enquiring a few shops we decided to go with Manta Rhei Dive Shop. 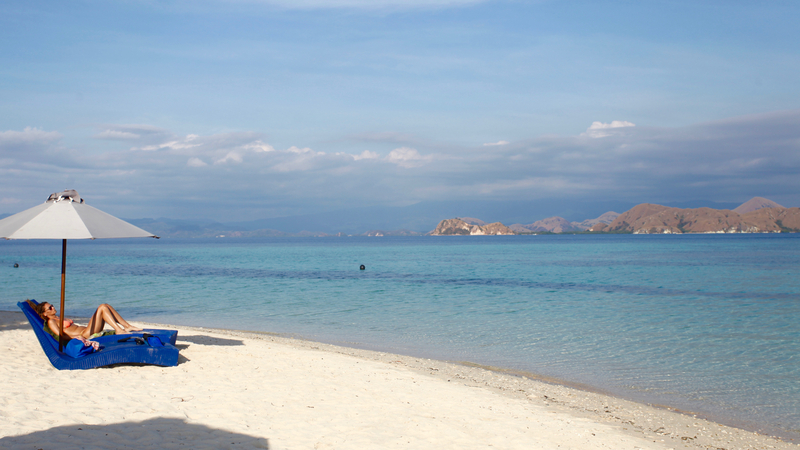 We booked a 3 dive day trip to central komodo. The other shop Uber Scuba was going to north komodo and it required AOW certification and involved more strong currents. 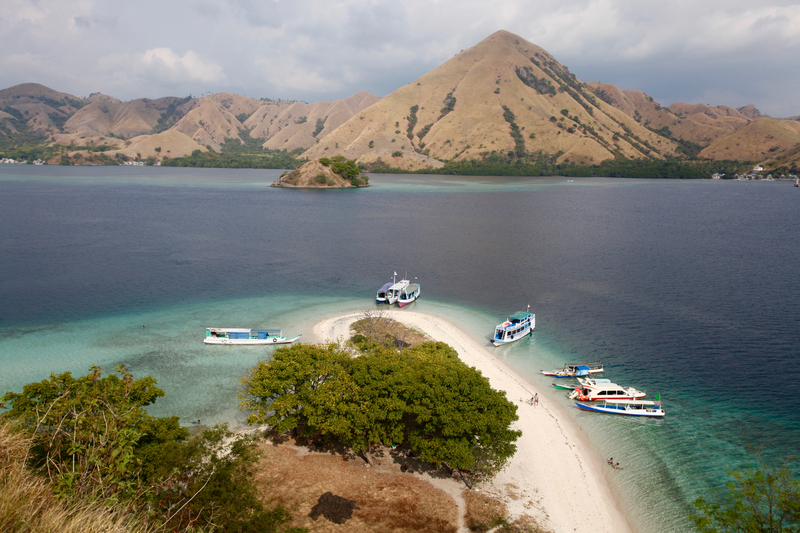 We had already booked day tours with Alba cruise for exploration of the komodo islands. Day 2 (June 4 2018): It was 5 AM when we woke up and got ready for a day tour. The driver from Alba Cruise picked us up at 6 in the morning. The cruise starts from the pier at La Prima Hotel south of the main market of L Bajo. The tour today had 14 tourists and we started at 7 AM from the mainland. 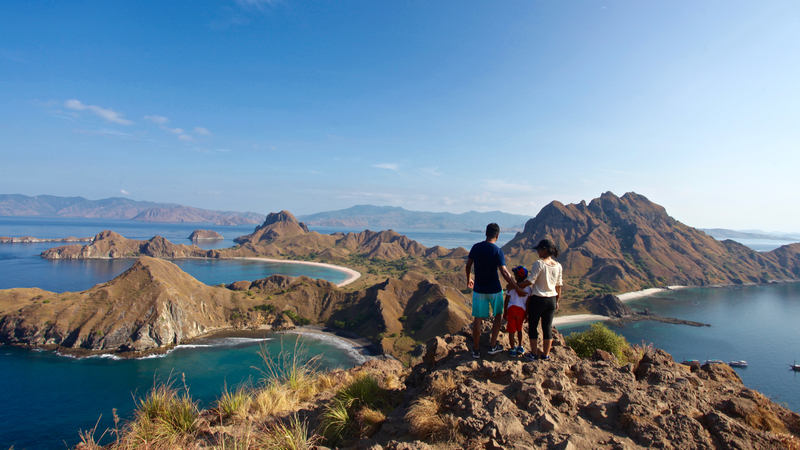 The first stop was the iconic and beautiful Padar Island.Once we docked on the island, the hike to the top view point took us 30 mins. The view from the top is one of the most beautiful you will see anywhere on the planet. After spending some time on the top we had our breakfast which we carried from the hotel. There are few trees on the top which provided the much needed shade under the bright sun. The view from top is stunning and we can see three coloured beaches black, white and pink in three different sides. This unique formation from nature is what attracts millions to the place. We spent almost 30 minutes on the top. It is better to have sports shoes for the hike though it can be done in flippers also. 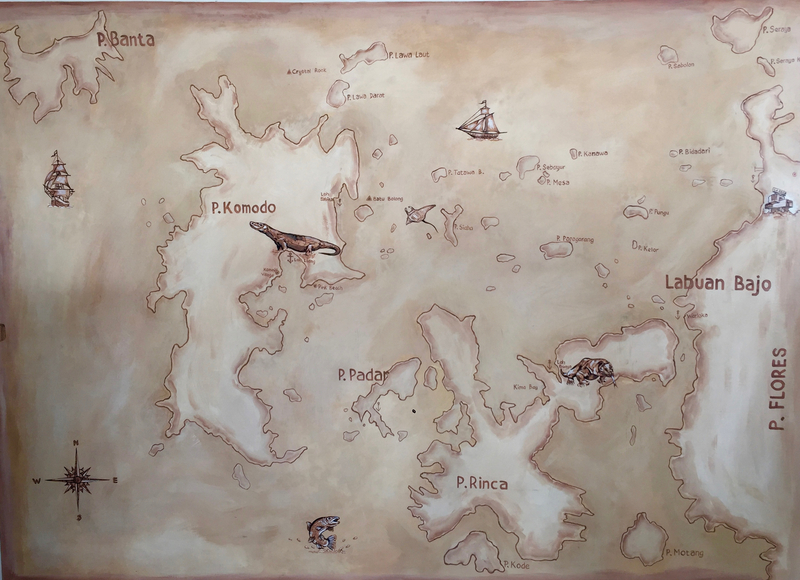 The next stop was the Komodo Island. 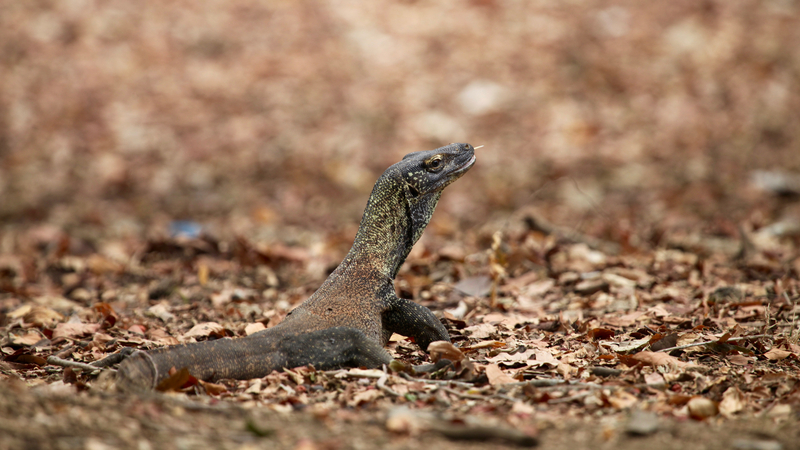 The park is the home to the endangered komodo dragons. It takes around 1 hr to do the medium trek. 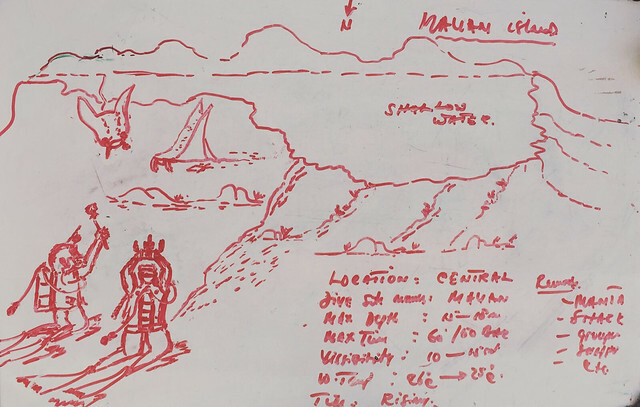 We saw quite a few dragons while on the trek. We also saw deer, kiwi birds and wild buffaloes. It gets quite hot and better to carry water with you while on the trek. 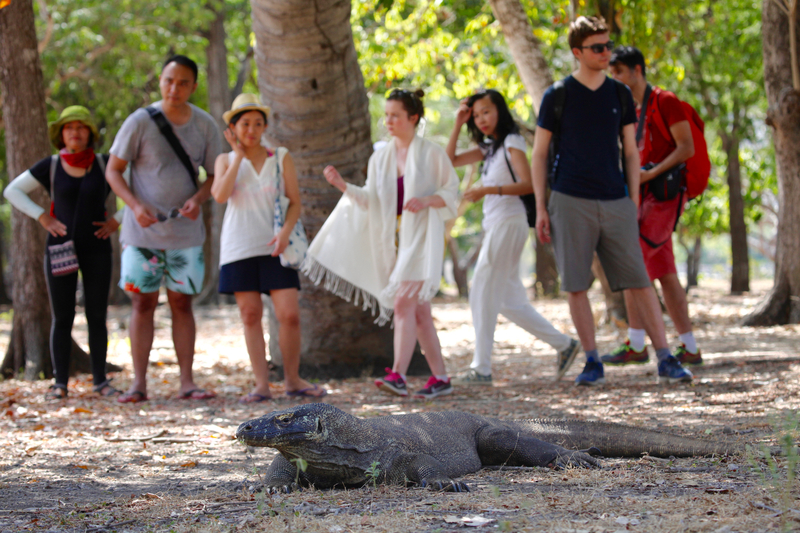 The Komodo and the fellow passengers of the trip. From Komodo we moved on the the next three stops which are basically beaches with snorkelling. 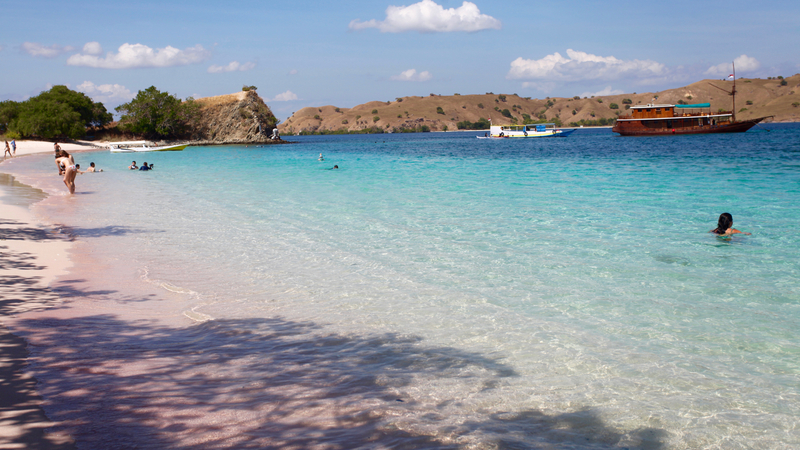 The first is the pink beach in komodo island. The white sand has red particles in it which makes it look pink. 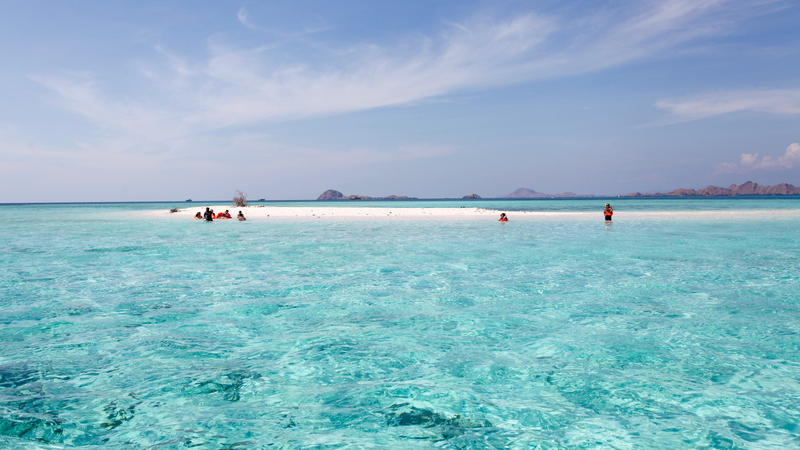 Then we went to Taka Makassar the most beautiful sand bar we have seen. 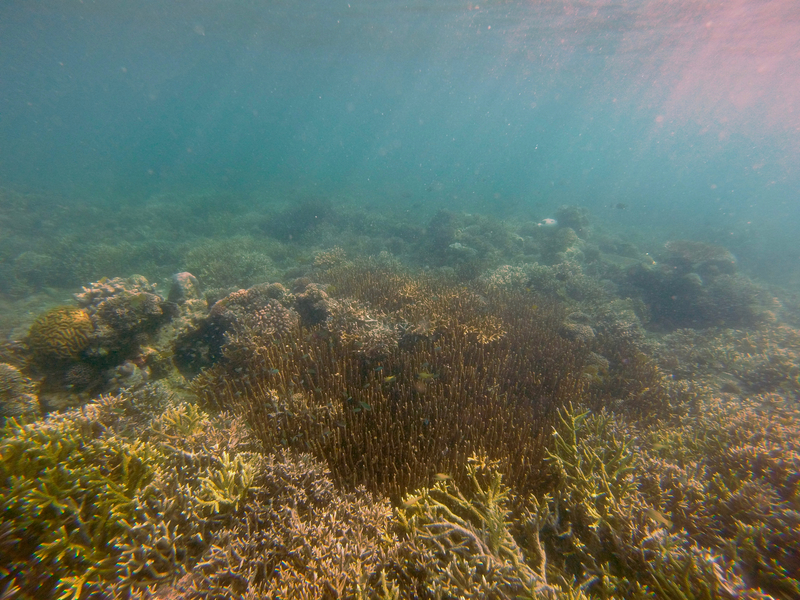 Here snorkelling is beautiful. Then we move little ahead on the boat to the Manta point. 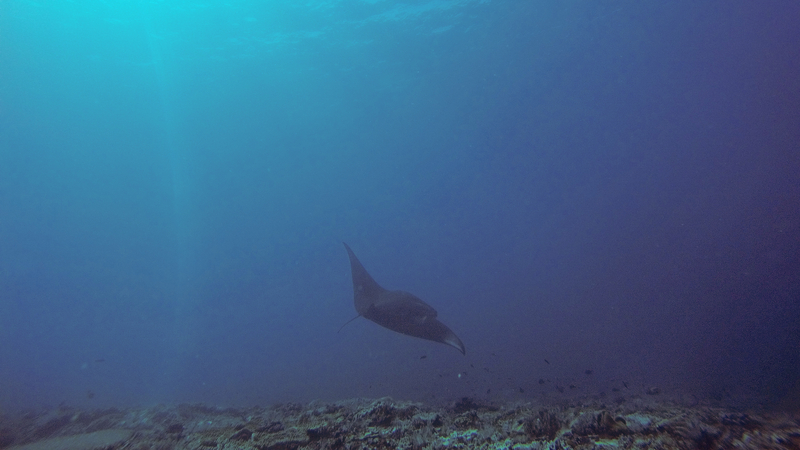 Here we encountered huge manta swimming below in the ocean floor. 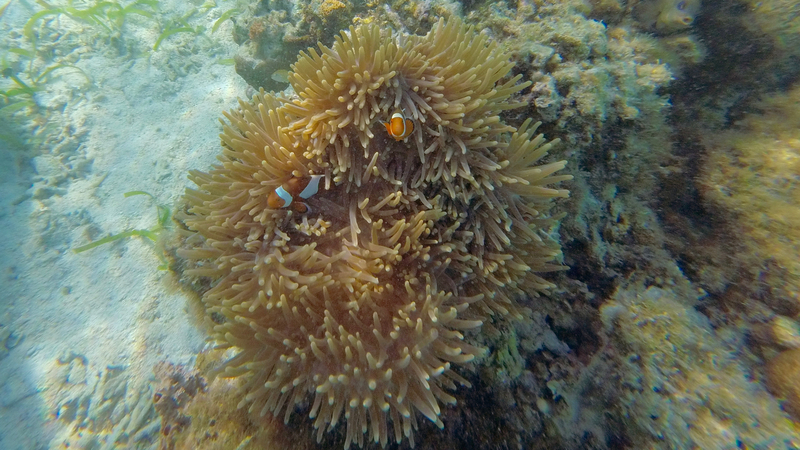 Although they are huge, snorkelling does not give a nice perspective compared to diving. 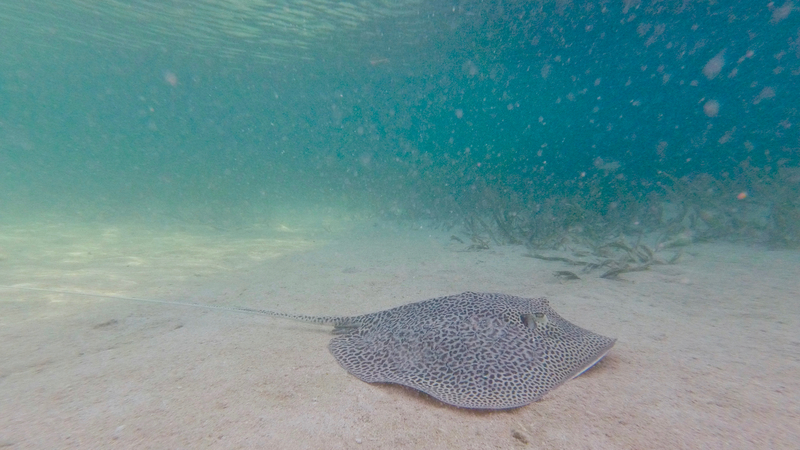 The places are are stunning and make sure you come with your go pro for the underwater shots. It is paramount that you know swimming. Current is very strong in Manta Point. You have to swim to the sand bar from your boat. 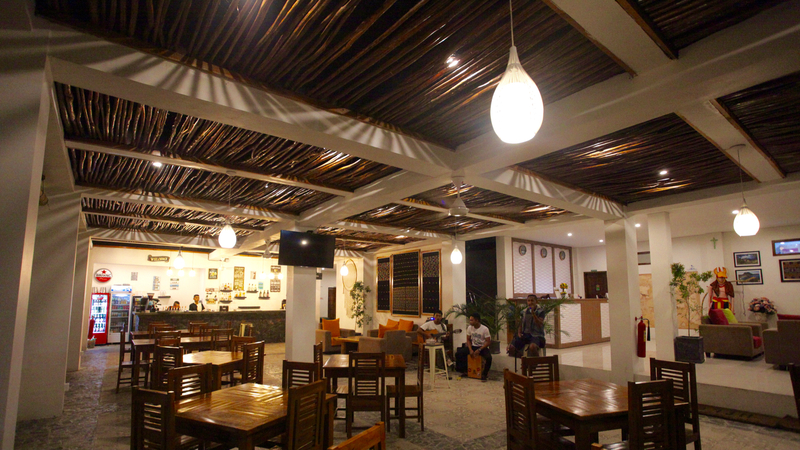 The last stop for us was Kanawa Island which has a hotel also. The beach is white sand one and the snorkelling around is fantastic. Let the pictures speak for themselves. From here we moved back to the hotel and ended a very beautiful day trip. The eagle ray and the island from the pier. Day 3 (June 5 2018): The dive day. 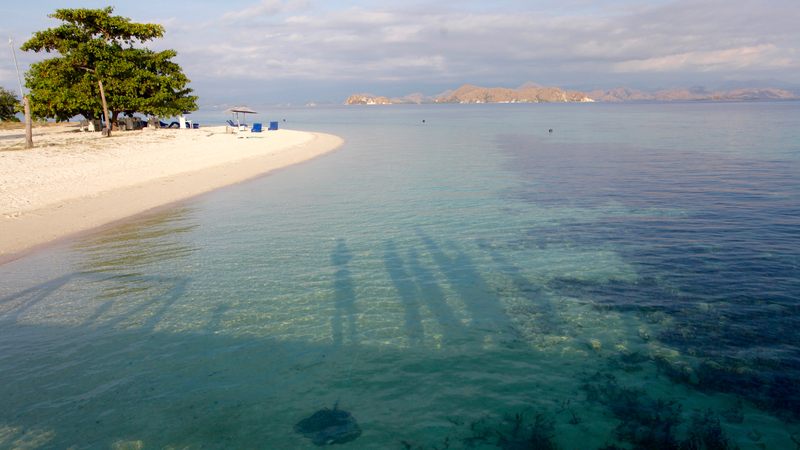 We spend the whole day diving in central komodo national park. 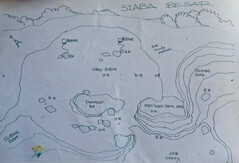 We dived in Siaba Besar, Makassar Reef (Manta Point) and Mawun. 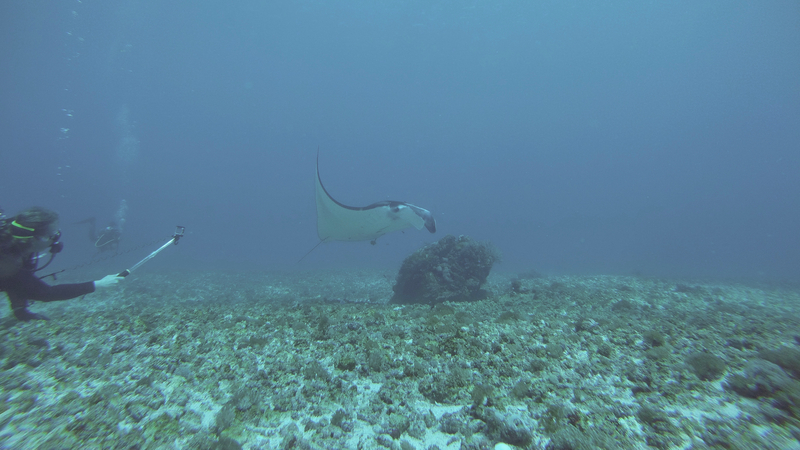 The day was overall fantastic with numerous corals, 2 sharks, 5 turtles and 8 manta rays. Never has been diving so beautiful in our life. The dive boat of Manta Rhei Dive shop is huge and amazing. The food was good and the dive master Nero brilliant. The turtle at Siaba Besar. Day 4 (June 6 2018): After beautiful dive day yesterday, today we take is easy on a day tour to Rinca island followed by snorkelling in Mengerite island and then a beach view from Kelor island.We booked a half day tour of the islands with Alba cruise. They picked us up at 9:30 AM from the hotel. 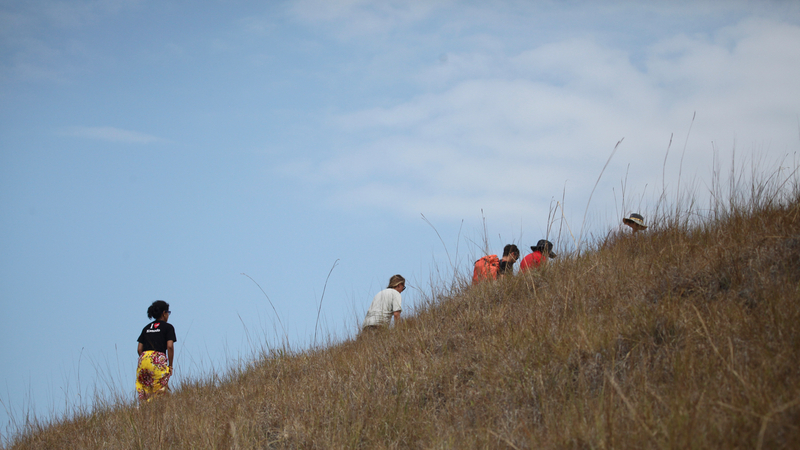 We were amazed by the number of komodo dragons we saw in Rinca. 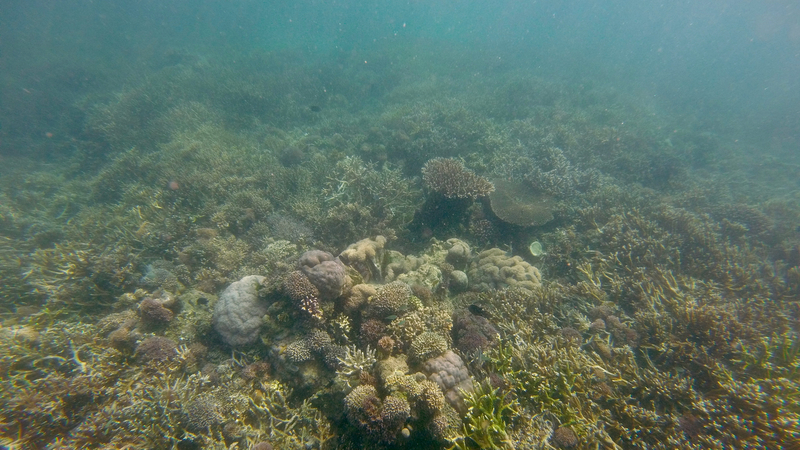 The corals are beautiful in menjerite. After a view from top in Kelor, we were dropped off in the mainland at 3 PM. 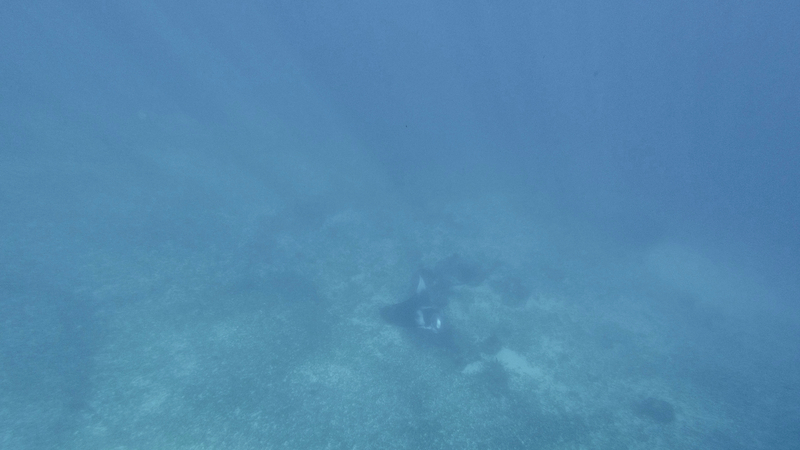 The short and easy day is a nice thing to do if you are tired of land dive trips. 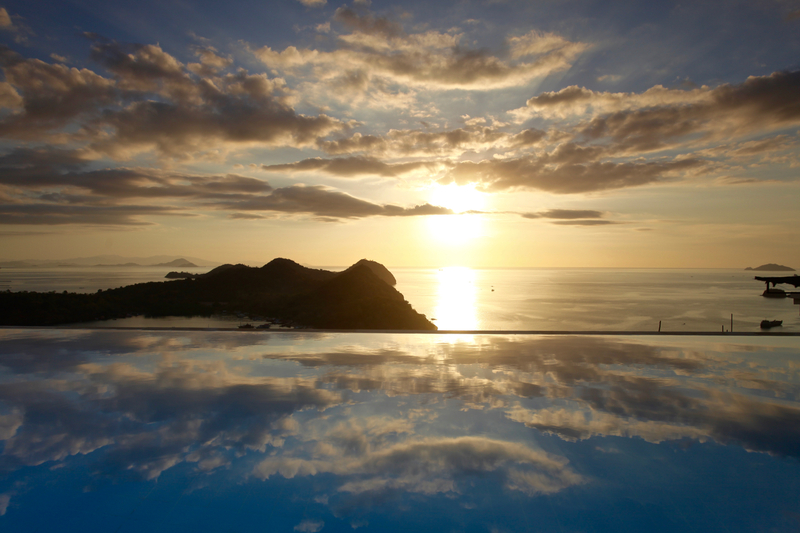 We always had a motivation for the live music and sunset from Le Cecile hotel in Bajo. 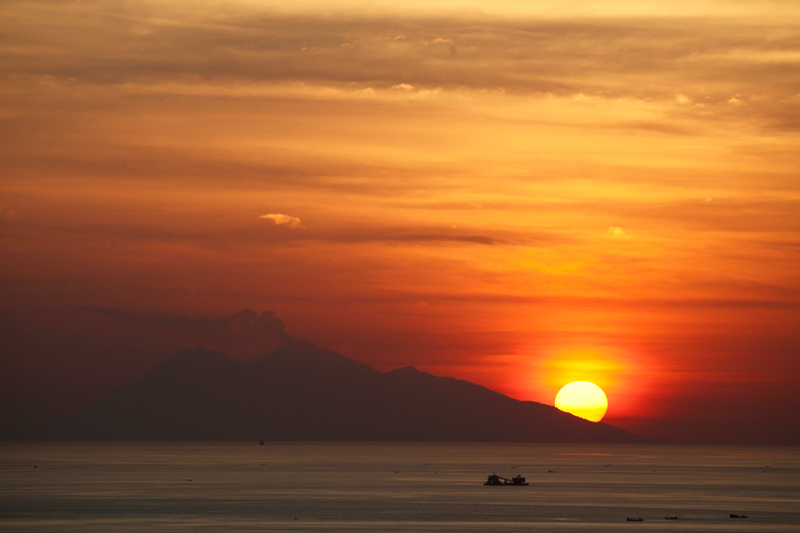 Let us know if you have seen a sunset like this other than paintings. The good part of the day trips from Alba cruise is that they have a speed boat and the distance are covered on very less time. The local boats are good, but slow and you spend more time on the boat. So if you want to spend more money and do more things, definitely alba cruise is recommended. A baby komodo lizard at Rinca Island. 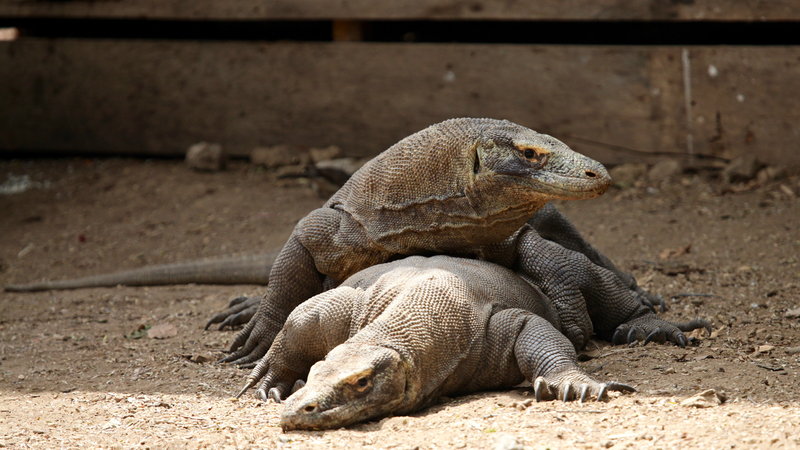 A mating pair of Komodo in Rinca Island. Day 5 (June 7 2018): Today we head out to Lombok via Bali and stay close to airport. The flights were all on time and we had just enough time to go out to Kuta for some delicious lunch. This time we went to an Indian restaurant in the main road of Kuta and food never tasted so good. 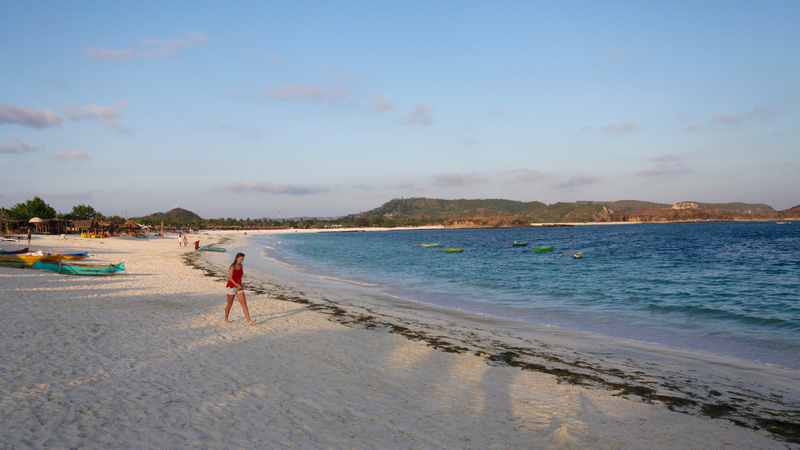 We reached Lombok at 3 PM and then booked a taxi from the hotel for the white sand Caribbean like beach of Tanjung Ann. From airport it takes around 30 minutes to the beach. After spending some time here we went to Kuta beach. This beach has many restaurants along the shore. We decided to have dinner here. After so many days in the islands of Bali, Flores and Lombok tomorrow we head out back home. But this two weeks in the islands has been some of the best times we had. Flores is really beautiful and need even more time for proper exploration. May be next time. 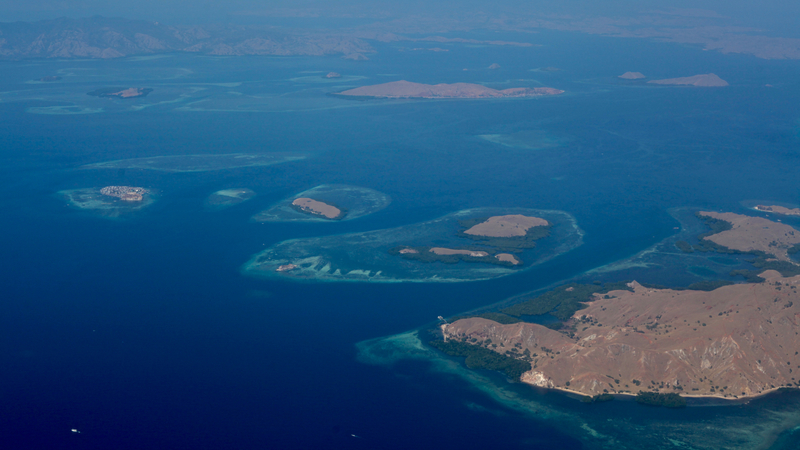 The beautiful Komodo National Park from air. We flew NAM Air form Bali to Labuan Bajo and Wings Air from Labuan Bajo to Lombok. We stayed at Le Cecile Hotel and Cafe. The day trip cruise was from Alba Cruise while the diving trip was from Manta Rhei Dive Centre. Every one of these are amazing service or property. We definitely recommend them. 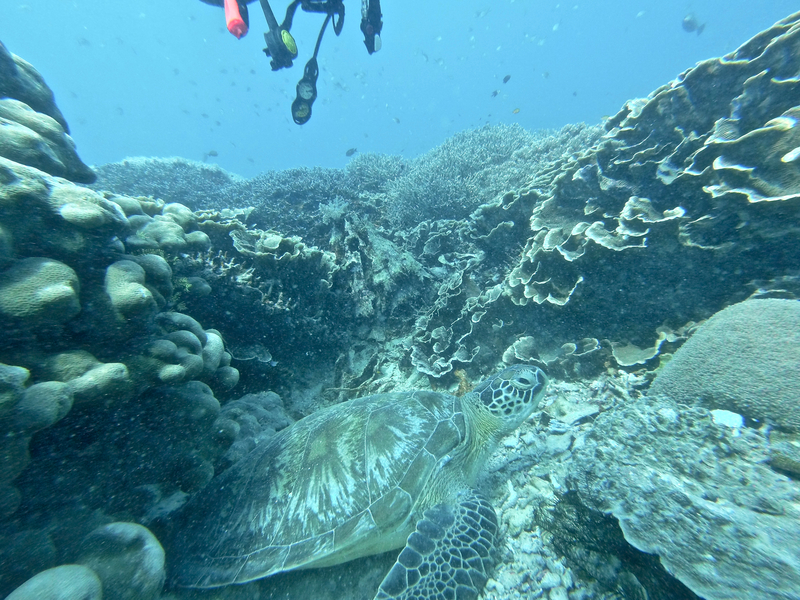 Siaba Besar is famous for green turtles and sharks. 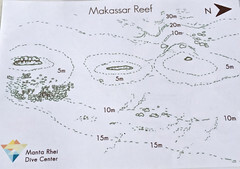 Makassar Reef also known as Manta Point. Known for strong currents.